High-density, next-generation computer memory that can store about one terabyte of data on a device the size of a postage stamp — more than 50 times the data density of current flash memory technology — is now a step closer to mass production. That’s because Rice University’s breakthrough silicon oxide technology will allow manufacturers to fabricate “resistive random-access memory” (RRAM) devices at room temperature with conventional production methods, the researchers say. In a new paper in Nano Letters, a Rice team led by chemist James Tour compared its RRAM technology to more than a dozen competing versions. The basic concept behind resistive memory devices is the insertion of a dielectric material — one that won’t normally conduct electricity — between two wires. When a sufficiently high voltage is applied across the wires, a narrow conduction path can be formed through the dielectric material. The presence or absence of these conduction pathways can be used to represent the binary 1s and 0s of digital data. Research with a number of dielectric materials over the past decade has shown that such conduction pathways can be formed, broken and reformed thousands of times, which means RRAM can be used as the basis of rewritable random-access memory. RRAM is under development worldwide and expected to supplant flash memory technology in the marketplace within a few years because it is faster than flash and can pack far more information into less space. Tour and colleagues began work on their breakthrough RRAM technology more than five years ago. The key ingredient of Rice’s RRAM is its dielectric component, silicon oxide. Silicon is the most abundant element on Earth and the basic ingredient in conventional microchips. 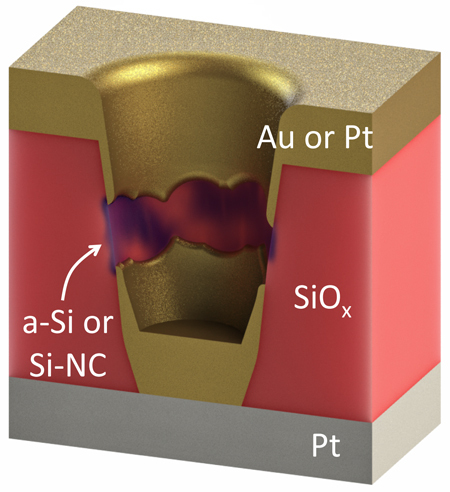 Microelectronics fabrication technologies based on silicon are widespread and easily understood, but until the 2010 discovery of conductive filament pathways in silicon oxide in Tour’s lab, the material wasn’t considered an option for RRAM. Since then, Tour’s team has raced to further develop its RRAM and even used it for exotic new devices like transparent flexible memory chips. “Our technology is the only one that satisfies every market requirement, both from a production and a performance standpoint, for nonvolatile memory,” Tour said. In the latest study, a team headed by lead author and Rice postdoctoral researcher Gunuk Wang showed that using a porous version of silicon oxide could dramatically improve Rice’s RRAM in several ways. “That means we can take a sheet of porous silicon oxide and just drop down electrodes without having to fabricate edges,” Tour said. “When we made our initial announcement about silicon oxide in 2010, one of the first questions I got from industry was whether we could do this without fabricating edges. At the time we could not, but the change to porous silicon oxide finally allows us to do that. Oxide-based two-terminal resistive random access memory (RRAM) is considered one of the most promising candidates for next-generation nonvolatile memory. 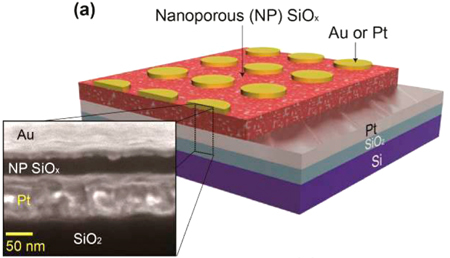 We introduce here a new RRAM memory structure employing a nanoporous (NP) silicon oxide (SiOx) material which enables unipolar switching through its internal vertical nanogap. 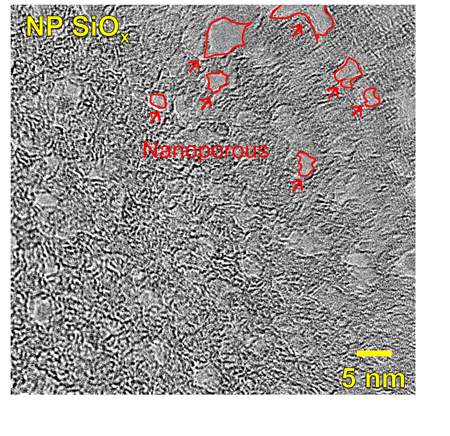 Through the control of the stochastic filament formation at low voltage, the NP SiOx memory exhibited an extremely low electroforming voltage ( 1.6 V) and outstanding performance metrics. These include multibit storage ability (up to 9-bits), a high ON–OFF ratio (up to 107 A), a long high-temperature lifetime (≥104 s at 100 °C), excellent cycling endurance (≥105), sub-50 ns switching speeds, and low power consumption ( 6 × 10–5 W/bit). Also provided is the room temperature processability for versatile fabrication without any compliance current being needed during electroforming or switching operations. Taken together, these metrics in NP SiOx RRAM provide a route toward easily accessed nonvolatile memory applications.